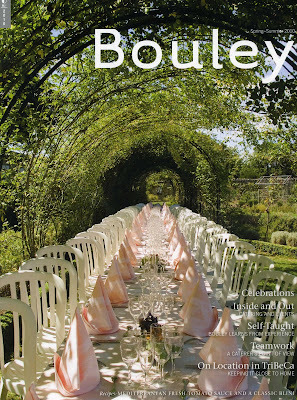 Self Love.Self Care.Inspiration: Bouley, excellence, details, dentistry? An afternoon spent at Bouley in Tribeca not only soothed my foodie soul but got me thinking about all that goes into making someone's "experience"an exceptional one. What is it that happens behind the scenes to ensure a seamless and incredible delivery of service that not only provides the recipient with more than what they came in for but in addition leaves them feeling special, appreciated and taken care of? My family's recent visit to David Bouley's flagship restuarant in Manhattan was a culinary experience of the highest order (http://www.davidbouley.com). From the moment we arrived to when we left, we felt that we were the most important guests that day. It started with the hostess treating my daughters (ages 7 and 12) as if they were young adults and including them in the welcome. Once seated in the beautifully appointed dining room, there was no end of staff that made us feel that we were there for an experience, not just a meal. The service was attentive, unobtrusive and personal. I couldn't help but notice the incredible amount of detail that went into Chef Bouley's team, led by Marcellin Fal that afternoon, to make us feel that we were part of something bigger than just having lunch at a fancy restaurant. It was as if we were cherished guests at someone's home ( a mansion maybe, considering the luxurious appointments of the room, fresh flowers arranged with fall imagination, elegant silverware and china, and crisp linens) for the afternoon. The tasting menu took us on a imaginative journey of fresh vegetables, seafood, meat and game cooked in a a variety of sauces and presentations, and of course incredible desserts. A story was being told through every course. The staff could tell that we were there to create a family memory, and they actually became excited to participate in our experience by becoming part of the table. They were engaging with our daughters and enjoyed hearing their reviews of the bathrooms (the best ones they've been in) and comments about the food. At the end of our 3 hour lunch, we felt that we had just had a vacation. They also quickly realized my interest in food, cooking and entertaining, and they regaled me with tales of how Chef Bouley cooks even if his hands are tied- literally. He had suffered a kitchen accident a few weeks before our visit, and reportedly the day after his surgey had come into the kitchen with a cast on his hand saying he was there just to" look". However after a few minutes, he was stirring pots with his left hand. That's passion, and the blessing of doing something in life that you just cannot stay away from. I also found out that he had learned how to cook from his grandmother in France as a young child. That resonated with me, as I too had started my love affair with food at the side of my grandmother, Biji, as a 10 year old. I fondly remember her early lessons of showing me how to wash my hands before touching anything in the kitchen. She was strict about kitchen hygiene and felt that the basics were the most important part of preparing an excellent meal. Guess what? She was right... After learning the ABC's of North Indian cooking following the basics of kitchen protocol from Biji, I have been able to translate that training into being able to cook in many different styles and cuisines. The bottom line, however, was the feeling with which she cooked. That was her biggest gift to me. Her love for the people that would eat the meals she prepared was the main ingredient in her cooking. And that is what I try to do. It starts with my desire to communicate my love, appreciation and gratitude for the people that I cook and bake for. It is my way to say thank you for being a part of my world. So don't be surprised if you come into the office on a Saturday morning and have a freshly baked peanut butter chocolate chunk cookie waiting for you at the end of your visit (along with a toothbrush). It's just me saying thanks for allowing me and my team to take care of your dental needs. Imagine my delight when Marcellin invited me to tour Chef Bouley's kitchen at the end of our visit. It was pure heaven to see the super organized work space of the team that executes the gastronomical delights that excite patrons day after day. The creativity and attention to detail is facilitated by the systematic approach to their craft but it is their teamwork that makes it all come into focus. Thank you, Marcellin, for all the time you spent with my family and the very generous extra's that were compliments of the chef. I left inspired by the vision and passion of Chef Bouley and his team. I felt a renewed passion for my own love of dentistry and how we help our patients get excited about their health and well being. On the drive back to New Jersey, my mind was full of all the details my team takes care of behind the scenes before a patient is even seated in the chair, and additional ones that I can implement. Nothing great is accomplished without a vision. Those that lead in any field are fearless because they dare to redefine excellence on a continuous basis. They also have the ability to design the details that acheive that vision and exceute it consistently. Of course, nothing happens without a team that works together to make the vision a reality. Leaders have the talent to pick and assemble dedicated and talented individuals that come together and orchestrate a symphony that is harmonious, sounds heavenly and appears effortless. I will be introducing a 4 part series of blog entries to bring to life the nuances and details of the first few visits to my office. My sincere hope is that you will gain a full understanding of the scope and delivery of dental care at our practice, and learn what you, as my patient, can do to ensure that you experience optimal health and well being on a daily basis. In addition to my taking ideas and inspiration from other professions (such as those from Chef Bouley) to improve my healthcare delivery, I am continuously inspired and motivated by Dr. Peter Dawson, one of the giants of dentistry. Remember that excellence is a journey, and it takes a lot to be able to hit all the high notes and run on all cylinders. Our goal is to create higher expectations and deliver at the level of those expectations; however, we are always a work in progress. I salute David Bouley as a leader in his profession and an inspiration to those that aspire to break all boundries and define the standards of their field on their terms. I respectfully acknowledge Dr. Peter Dawson as an individual who has moved me to redefine "usual and customary" dental care and dedicate the next 4 entries to him with my gratitude. I end by paying homage to my Biji who taught me about putting love into everything I do. Love is what gives meaning to all other values, including passion and the pursuit of excellence! I look forward to having you join me next time as I talk about your New Patient Experience at my practice.